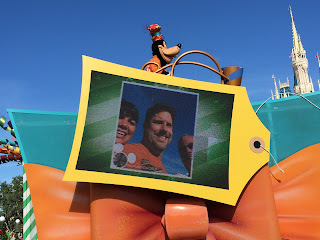 Digital Disney World: DDW Pic 1195. Move It! Shake It! Dance & Play It! Recently, the "Move It! Shake It! Celebrate It!" street party had a makeover at the Magic Kingdom. Although similar in concept, it is now called "Move It! Shake It! Dance & Play It!" and it features a new soundtrack and some new characters. There have also been large video monitors added to each float. Throughout the performance, guests are encouraged to tweet their selfies on Twitter using a specified hashtag. Then, toward the end of the party, these photos begin to show up on the screens. You can see that my photo with friends popped up on this float with Goofy on top.